ST. LOUIS (AP) — Jamie Benn wanted in on the fun after missing the last two games with an injury. He came up big in his return. Benn had three goals for his fifth career hat trick, and the Dallas Stars beat the St. Louis Blues 4-1 on Saturday night. "It's not fun watching," Benn said. "That's for sure. But for the games I did watch our team played pretty good. It was obviously nice to get back out there tonight." 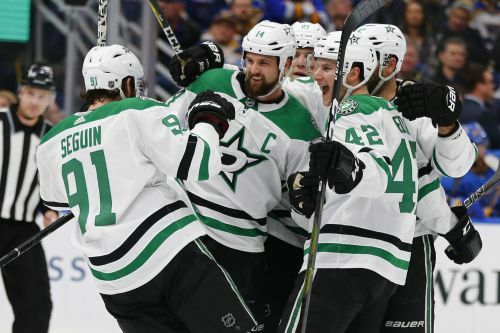 John Klingberg had a goal and an assist, and St. Louis native Ben Bishop made 29 saves as the Stars improved to 3-1 this season and 6-1-0 in their last seven games against the Blues. Dallas has won three of its last four and pulled three points behind St. Louis for third place in the Central Division. Alex Pietrangelo scored for the Blues, who snapped a seven-game home winning streak. It was also their fourth loss in six games since Dallas snapped their franchise-record 11-game win streak on Feb. 21. Jordan Binnington had 17 saves while falling to 15-3-1 in 19 career starts. Pietrangelo got the Blues on the board with 4:20 left in the second to cut the deficit to 2-1. But Benn answered with a power-play goal with 2:49 remaining in the middle period. Tyler Seguin and Klingberg got the assists to help stymie the St. Louis comeback. "I thought it wasn't the prettiest, but we had a great team effort and found a way to get two big points," Benn said. Benn scored an empty-netter late in the third to complete the hat trick. "Having him back you could tell there was more jump by our team and a lot more confidence," Stars coach Jim Montgomery said. "Obviously his will and determination on his goals was really important to our victory." Benn redirected Taylor Fedun's shot to give the Stars a 1-0 lead with 3:08 left in the first period. Benn has 39 points (19 goals, 20 assists) in 39 career games against St. Louis. "It's always fun playing the Blues," Benn said. "They're a good team, they've got great players. It gets a little rough at times but that's hockey and it's not very old school but I guess it's the new school." Klingberg made it 2-0 with 1:16 left in the first, picking out the upper right corner with a quick wrister from the slot. It was his first goal in 12 games dating back to Feb. 4. "We don't score as much as a team anymore," Klingberg said. "We talked about it before, I can't start chasing my own game to try and score my points. It doesn't work like that. As long as I still create, I think that's good." The Blues haven't scored more than two goals in six straight games. "We've got to find a way to get some goals here again," Blues coach Craig Berube said. "It's kind of dried up for a few games now. We're getting some looks but it's not the same. We're not controlling the play in the offensive zone as much as we were when we were getting good looks." NOTES: Stars LW Blake Comeau had an assist on Klingberg's goal, giving him 299 career points. ... Blues LW Jaden Schwartz was fined $5,000 by the league for a cross-check of Carolina's Dougie Hamilton during Friday's game. ... The Stars reassigned RW Denis Gurianov to Texas of the AHL to make room for Benn. ... The Blues recalled F Sammy Blais under emergency conditions. He replaced C Robby Fabbri, who was a healthy scratch. Dallas: Hosts the New York Rangers on Tuesday night. St. Louis: At Anaheim on Wednesday night.